This blog chapter features two new characters. Kristin’s good friend Sarah and her husband Scott. Sarah and Scott (aka S-cubed) have been living in Birmingham, England for the last year and a half on a 2-year work transfer assignment. 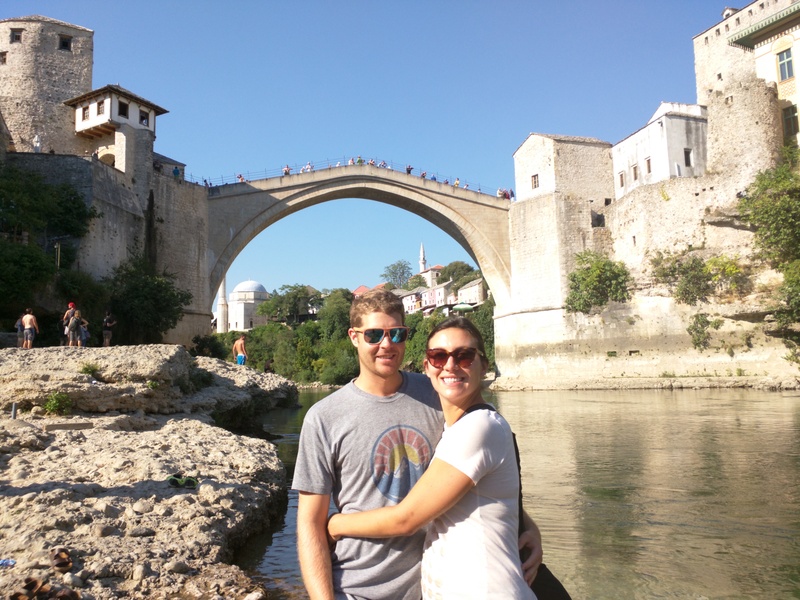 We were luckily they were able to get time off and join us for a 5-day trip through Croatia, Montenegro and Bosnia. After Mali Ston, we bused to Dubrovnik, Croatia where we spent a night before S-cubed arrived. Dubrovnik is a gorgeous walled city in the far south of Croatia. 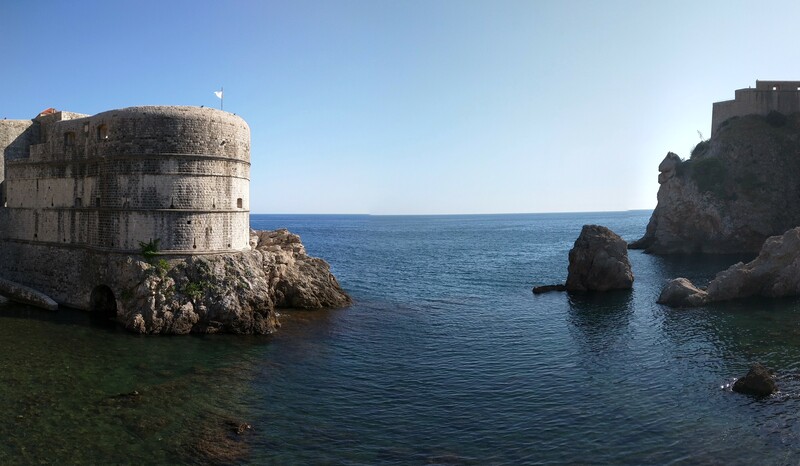 You have seen it many times, as Dubrovnik is the shooting location for King’s Landing in the show Game of Thrones. We even found ourselves walking up a big limestone staircase before reaching the top; we realized this was the staircase Cersei disgracefully climbed naked in the final episode of last season. Very fun. Although we did not take one of the popular Game of Thrones walking tours where they show you many of the shooting locations within the city. The battle of blackwater, began right here. On our second morning in Dubrovnik, S-cubed arrived and our tour began. That afternoon, we rented kayaks and paddled around the old city walls and to a secluded beach. That night we all went into town for a big meal of grilled fish and squid. The view from the AirBnb we rented. The next morning we arose early to go rent a car and begin driving to Kotor, Montenegro. 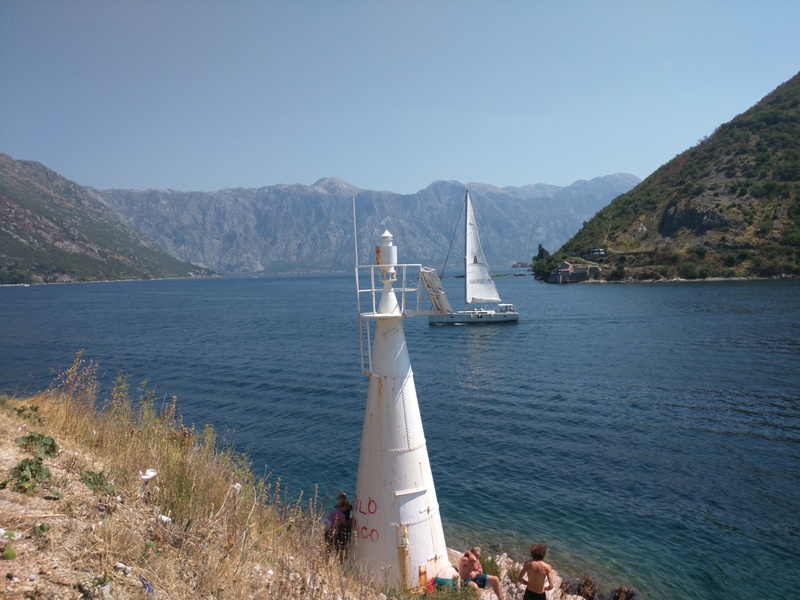 Montenegro is a small country, just a couple hours drive from Dubrovnik. We were only here for a day, and night. Kotor is famous for its walled fortress and connected mountain top castle. After climbing over 1300 stairs, to the top of Kotor castle, we felt like we were seeing double. After a great day hiking the Kotor fortress and an awesome rooftop dinner at Hippocampus. We set off in the morning for a beautiful drive around the bay of Kotor, headed to the country of Bosnia and Herzegovina. 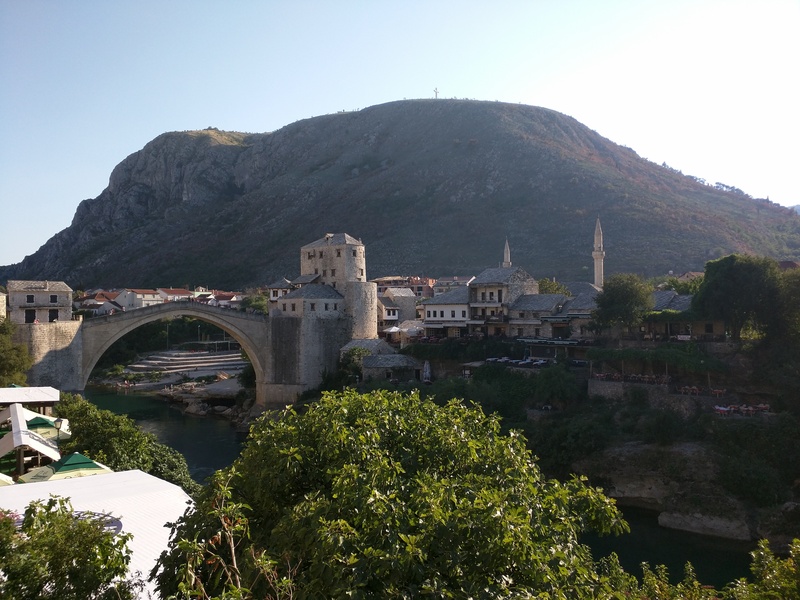 Our first stop in Bosnia was Mostar. Capital of the southern half of the country, the Herzegovina half , Mostar is a thriving city, with a storied, and tragic history. Mostar is most famous for its bridge. The largest stone bridge in the world. It was built by the Ottomans in the 1557, and spans a river, up to 60 feet up. Locals and tourists will jump off this bridge, and Red Bull recently hosted a professional cliff diving event here. The tragic, side of history was that the bridge was almost completely destroyed during the Bosnian war, I wrote a short history below. It was rebuilt only a few years ago, but they rebuilt it only using methods available during the original construction. Meaning every stone, and lead anchor was cut, cast and pinned by hand. On one side of the bridge was a museum of war time photos, its chilling to see that most of the city was completely leveled by shelling. Notice the color difference between the newer (whiter) stone of the bridge and the older (browner) stone of the supporting walls. Unlike most history we’ve seen so far, this was a war we remembered, a war that ended not even 20 years ago. Everyone person you meet in Bosnia lived through this experience. We couldn’t imagine continuing to live in a place after living through a war like this one. On our final day, we headed to Sarajevo, where S-cubed would leave us for our flight to Turkey. We enjoyed a tour of the old city, seeing the bridge where Archduke Franz Ferdinand was assassinated, starting WWI. We then had lunch at the awesome Sarajevo Brewery, who thanks to an underground spring, kept cranking out brews even while the city was under enemy fire for almost 4 years. The history, the Bosnian War that we think of was really a civil war in the former country of Yugoslavia. The end result was that Yugoslavia broke apart into 6 (7 if you include Kosovo) separate countries. There were 3 main ethnic groups in Yugoslavia, the Serbs in the East, the Croats in the West and Bosnaks caught in the middle. In 1991, the Croats seceded reasonably peacefully into 2 countries, Croatia and Slovenia. In 1992 the Muslim Bosnaks prepared to secede and create Bosnia, taking a substantial number of ethnically Serbian people who lived in Bosnia with them. The Serbs fought back, launching a brutal military campaign against them. It’s a very complicated story with fault on all 3 sides, but basically the country of Bosnia was ravaged and torn apart. As with any civil war, neighbors fought neighbors and horrific things happened. America ended the war soon after we stepped in, by bombing Belgrade, Serbia. The Serbian President Slobodan Miloševićk knew we’d level the city, and quickly ended the serb campaign. Country boarders were drawn. When the dust settled, thousands of Bosnaks were ethnically cleansed, Sarajevo was under siege for almost 4 years, Mostar was completed leveled and war crimes tribunals are still in progress. Not much was settled. Ethnic divisions are still very strong, but all the countries are stable, and economies are growing and people’s lives across the region are improving.